The climate research community uses reanalyses widely to understand atmospheric processes and variability in the middle atmosphere, yet different reanalyses may give very different results for the same diagnostics. For example, the global energy budget and hydrological cycle, the Brewer–Dobson circulation, stratospheric vortex weakening and intensification events, and large-scale wave activity at the tropical tropopause are known to differ among reanalyses. 3. to contribute to future improvements in the reanalysis products by establishing collaborative links between the reanalysis centres and the SPARC community. The project focuses predominantly on differences among reanalyses (although studies that include operational analyses are welcome and studies comparing reanalyses with observations are encouraged), with an emphasis on diagnostics in the upper troposphere, stratosphere and mesosphere. This special issue serves to collect research with relevance to S-RIP in preparation for the publication of the S-RIP report in 2018. Although participation in S-RIP is not a prerequisite for submission to this special issue, authors contributing to this collection are encouraged to consider contributing to the preparation of the S-RIP report. Sudden stratospheric warmings (SSWs) are abrupt rises in the wintertime polar stratosphere that also affect the troposphere. Their study is hampered by the limited observations in the stratosphere and mostly relies on reanalyses, i.e. models that include observations. Here we compare the representation of SSWs by the most used reanalyses. SSWs results are consistent across reanalyses, but some differences are found, in particular before the satellite era. Studies of the dynamics of stratosphere–troposphere coupling benefit from long observational records in order to distinguish common dynamical features from unrelated atmospheric variability. On the basis of a comparison between a range of reanalysis products, this study argues that the period from 1958 to 1979 is of significant value in the Northern Hemisphere for this purpose, despite the lack of global satellite records. Reanalyses are widely used products of various meteorological variables, generated using observational data and assimilation systems. 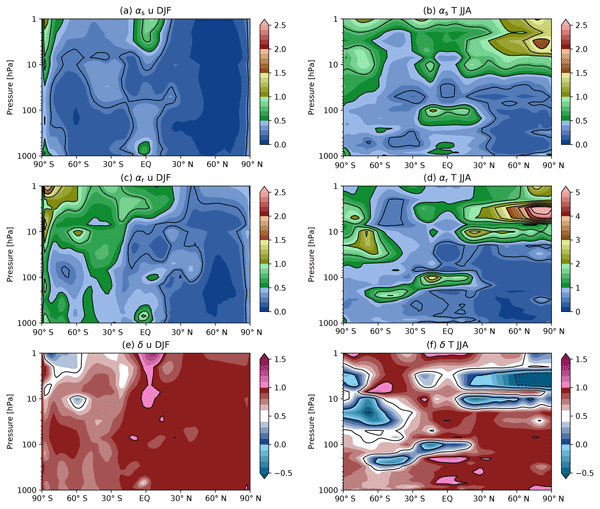 In this study, we compare six modern reanalyses, with focus on their representation of equatorial waves which are known to be important in stratospheric variability and stratosphere-troposphere exchange. Spreads among the reanalyses in the spectral properties, spatial distributions, and long-term variations of the waves are examined. 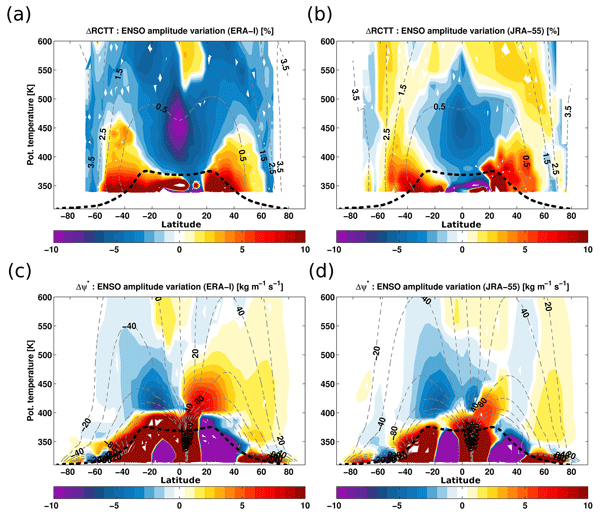 This paper examines the annual and inter-annual variations as well as long-term trend of modelled stratospheric water vapor with a Lagrangian chemical transport model driven by ERA-I, MERRA-2 and JRA-55. We find reasonable consistency among the annual cycle, QBO and the variabilities induced by ENSO and volcanic aerosols. The main discrepancies are linked to the differences in reanalysis upwelling rates in the lower stratosphere. The trends are sensitive to the reanalyses that drives the model. 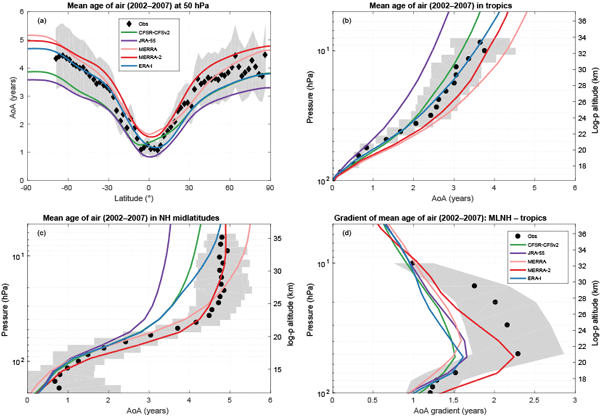 How robust are stratospheric age of air trends from different reanalyses? We analyze the change in the circulation of the middle atmosphere based on current generation meteorological reanalysis data sets. We find that long-term changes over 1989–2015 turn out to be similar for the reanalyses, mainly resembling the forced response in climate model simulations to climate change. For shorter periods circulation changes are less robust and the representation of decadal variability appears a major uncertainty for modelling the circulation of the middle atmosphere. 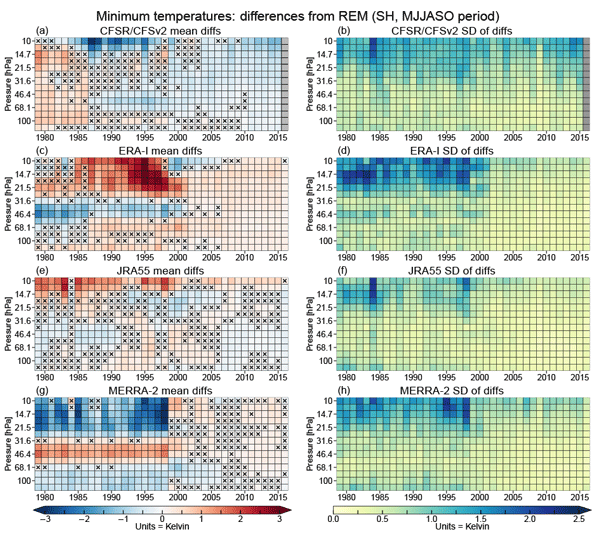 This paper assesses the structural changes in the shallow and transition branches of the BDC induced by El Nino using the Lagrangian model simulations driven by ERAi and JRA-55 combined with MLS observations. We found a clear evidence of a weakening of the transition branch due to an upward shift in the dissipation height of the planetary and gravity waves and a strengthening of the shallow branch due to enhanced GW breaking in the tropics–subtropics and PW breaking at high latitudes. A significant warming in the troposphere and cooling in the stratosphere are found in satellite measurements (2002–2017). The newest ERA5 data is firstly used for analyzing temperature and ozone trends in the UTLS and shows the best quality compared to other reanalyses. 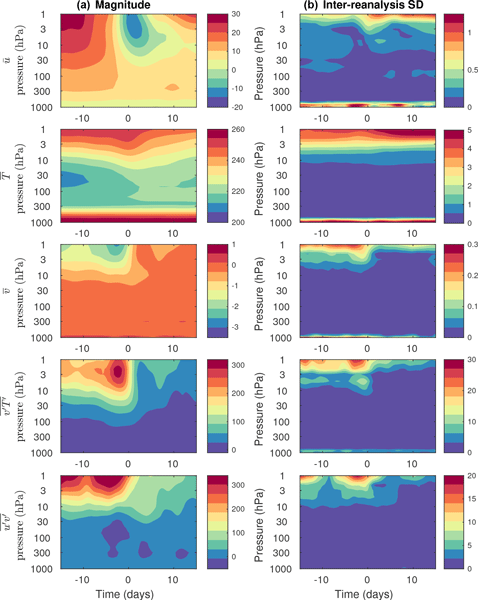 According to model simulations, the temperature increase in the troposphere and ozone decrease in the NH stratosphere are mainly connected to a surface warming of the ocean and subsequent changes of atmospheric circulations. The annular modes characterize the variability of the extratropical circulation. We show that they are extremely consistent across all reanalyses during the satellite era (1979 onward). Consequently, uncertainty in the annual cycle of variability of the tropospheric jet streams and their coupling with the stratospheric polar vortices is dominated by sampling uncertainty. Pre-satellite reanalysis of the Northern Hemisphere appears to be of high quality and can help reduce this uncertainty. Global characteristics and trends in the tropopause (the boundary between troposphere and stratosphere) over a 35-year period (1981–2015) are evaluated using both observations and models. The use of two coordinate systems reveals previously undiagnosed changes in the tropopause altitude within the tropics and extratropics and these results have important implications for studies of climate and atmospheric composition (especially that related to stratosphere-troposphere exchange). This data set provides 6-hourly zonal-mean diagnostics derived from global atmospheric reanalyses on pressure levels. Data include basic variables, such as temperature and three-dimensional winds, advanced diagnostics based on the momentum and thermodynamic equations, and model-generated diabatic heating rates. Diagnostics are provided both on latitude–vertical grids corresponding to data as originally obtained from the reanalysis centers and on a standardized grid to facilitate intercomparison. How well do stratospheric reanalyses reproduce high-resolution satellite temperature measurements? Reanalyses (RAs) are models which assimilate observations and are widely used as proxies for the true atmospheric state. Here, we resample six leading RAs using the weighting functions of four high-res satellite instruments, allowing a like-for-like comparison. We find that the RAs generally reproduce the satellite data well, except at high altitudes and in the tropics. However, we also find that the RAs more tightly correlate with each other than with observations, even those they assimilate. Stratospheric polar processing diagnostics are compared in both hemispheres for four recent high-resolution reanalyses. Temperature-based diagnostics show largest differences before 1999 in the Antarctic; agreement becomes much better thereafter, when the reanalysis inputs include higher-resolution satellite radiances. Recommendations for usage of reanalysis data in research studies are given based on the differences among the reanalyses, which can be substantial and difficult to interpret. A major phenomenon in the stratosphere is the Quasi Biennial Oscillation (QBO). Although a feature of the equatorial stratosphere, its influence extends to surface weather at both equatorial and mid latitudes. Improved knowledge of mechanisms of influence should help to improve weather forecasts. 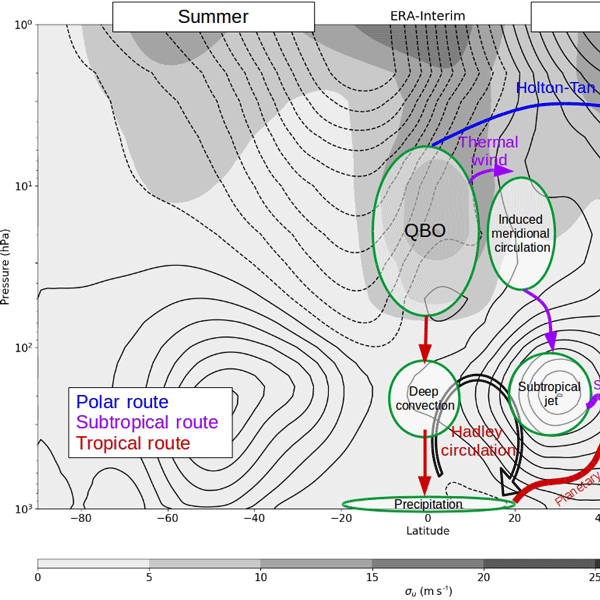 In this paper, QBO impacts at the surface are characterized and dominant mechanisms explored. Three pathways are identified, referred to as the tropical, subtropical and polar routes. This study evaluates the agreement between eight reanalysis datasets by comparing zonal-mean zonal winds and the forcing terms of the zonal-mean momentum equation during sudden stratospheric warming events. Results show that the spread between datasets increases exponentially with height and is largest during the most intense sudden stratospheric warming events. The largest uncertainties arise from differences in the mean meridional circulation and horizontal fluxes of momentum by eddies. Atmospheric solar tides in the stratosphere and lower mesosphere are examined using temperature data from five reanalyses and satellite measurements. The reanalyses agree reasonably well with each other and with the satellite observations, but the agreement among the reanalyses is weaker in the mesosphere. 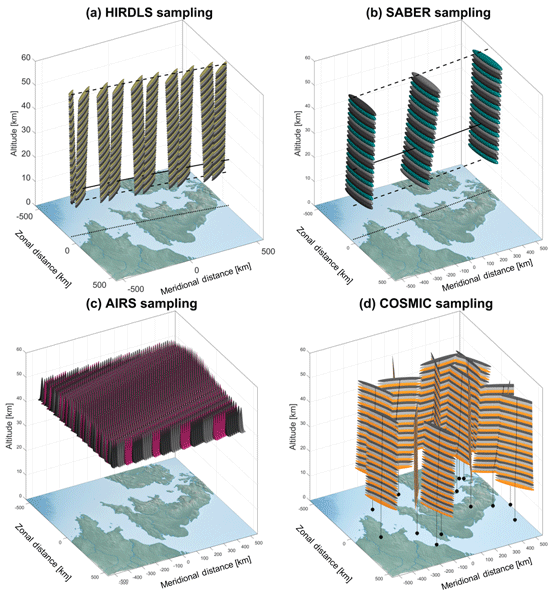 The assimilation of satellite data improves the representation of tides in the reanalyses, while long-term changes are mostly artificial and driven by changes in the input data employed. As part of the SPARC Reanalysis Intercomparison Project, we evaluate the temperature and wind structure of all the recent and past reanalyses with 2.5-degree monthly zonal mean data sets from 1979–2014. There is a distinct change in the temperature structure in the stratosphere in 1998. Zonal winds are in greater agreement than temperatures. All reanalyses have issues analysing the tropical stratospheric winds. Caution is advised for using reanalysis temperatures for trend detection. Ozone and water vapor in the stratosphere are important gases that affect surface climate and absorb incoming solar ultraviolet radiation. These gases are represented in reanalyses, which create a complete picture of the state of Earth's atmosphere using limited observations. We evaluate reanalysis water vapor and ozone fidelity by intercomparing them, and comparing them to independent observations. Generally reanalyses do a good job at representing ozone, but have problems with water vapor. The upper tropospheric–lower stratospheric (UTLS) jet stream and multiple tropopause distributions are compared among five state-of-the-art reanalyses. The reanalyses show very similar global distributions of UTLS jets, reflecting their overall high quality; slightly larger differences are seen in tropopause characteristics. Regional and seasonal differences, albeit small, may have implications for using these reanalyses for quantitative dynamical and transport studies focusing on the UTLS. 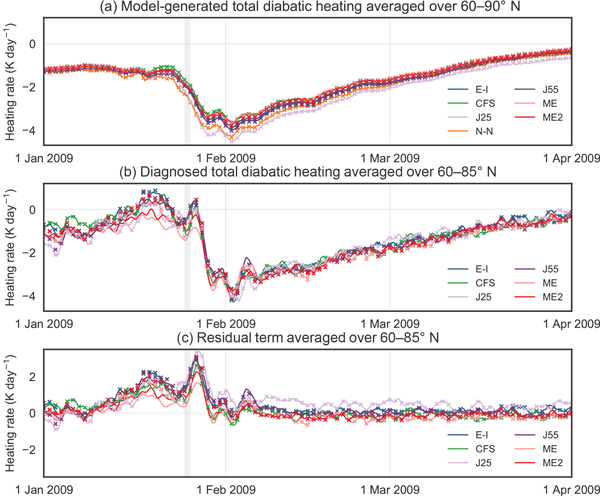 This study explores dynamical variability of the polar vortex in the stratosphere among the Japanese 55-year Reanalysis family data. Results show that the assimilation of conventional (surface and balloon) observations increases the dynamical variability as the vortex in the model is more quiescent without the assimilation. The assimilation of satellite data in addition to the conventional data strengthens and/or advances some vortex weakening events, although the impacts appear in various ways. An ozone mini-hole is a synoptic-scale region with strongly decreased total column ozone resulting from dynamical processes. Using total column measurements from the Ozone Monitoring Instrument and ozone profile measurements from the Microwave Limb Sounder, we evaluate the accuracy of mini-hole representation in five reanalyses. 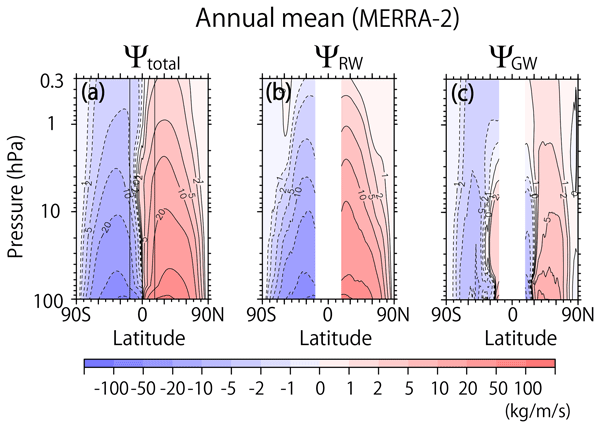 We present an intercomparison of temperatures and horizontal winds of five meteorological data sets (ECMWF operational analysis, ERA-Interim, MERRA, MERRA-2, and NCEP/NCAR) in the Antarctic lower stratosphere. The assessment is based on 19 superpressure balloon flights during the Concordiasi field campaign in September 2010 to January 2011. The balloon data are used to successfully validate trajectory calculations with the new Lagrangian particle dispersion model MPTRAC. From six different reanalysis products, we created a new comprehensive database of major sudden stratospheric warming events, which are large and rapid temperature increases in the stratosphere associated with a reversal of the stratospheric winter circulation. This new database can facilitate analysis of the evolution and surface impacts of these events as well as intercomparison of reanalysis products. Information from long-duration balloons flying in the Southern Hemisphere stratosphere during 2014 as part of X Project Loon are used to assess the quality of a number of different reanalyses. This work assesses the potential of the X Project Loon observations to validate outputs from the reanalysis models. In particular, we examined how the model winds compared with those derived from the balloon GPS information. We also examined simulated trajectories compared with the true trajectories. Large volcanic eruptions can eject aerosols into the stratosphere and prevent UV radiation reaching the surface, resulting in surface cooling. A secondary, non-linear effect occurs at high latitudes. While the surface cooling is robust in observations, we show that the non-linear, high-latitude effect is less robust. 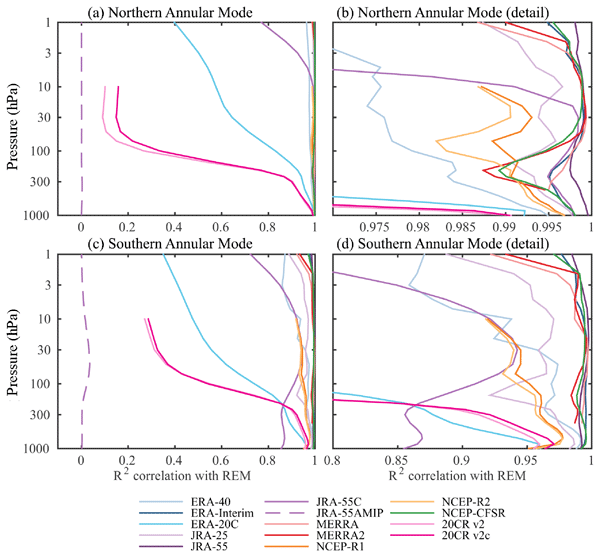 Climate models have failures at reproducing both aspects, probably because of aliasing with other climate modes and overrepresentation of stratospheric aerosol. Using seven reanalyses, we study the movement and drivers of the upper tropospheric–lower stratospheric anticyclone (AC) that forms during the Asian summer monsoon and is debated to be an important pathway for air masses to the stratosphere. We find that the distribution of the AC's centre position, and especially the so-called bimodality, largely depends on the reanalysis. Furthermore, we can connect shifts of the AC to precipitation and convection anomalies over India and the western Pacific. This paper compares the representation of the monthly-mean zonal wind in the equatorial stratosphere among major global atmospheric reanalysis data sets. Differences among reanalysis display a prominent equatorial maximum, indicating the particularly challenging nature of the reanalysis problem in the low-latitude stratosphere. Our study confirms that the high accuracy in situ wind measurements have provided important constraints to reanalyses of circulation in the tropical stratosphere. We report a comparison of the stratospheric mean-meridional circulation and eddy mixing in the stratospheric Brewer-Dobson circulation (BDC) among the six reanalysis products. Overall, discrepancies between the different variables and trends therein as derived from the different reanalyses are still relatively large, suggesting that more investments in these products are needed in order to obtain a consolidated picture of observed changes in the BDC and the mechanisms that drive them. This paper evaluates the temperature response in the troposphere and the stratosphere to the three major and three smaller-scale volcanic eruptions between the 1960s and the 1990s. This paper provides intercomparison results for 9 reanalysis datasets for the volcanic temperature response and other naturally induced variabilities. It was found that the volcanic temperature response patterns differ not only between the major and smaller-scale eruptions but also among the major eruptions.